Click here to register as a volunteer. Click here to register your organisation. It was a call for help from the Friends of Waitangi which led my husband John and I to volunteer to support the team behind the scenes at the Waitangi Treaty Commemoration celebrations. 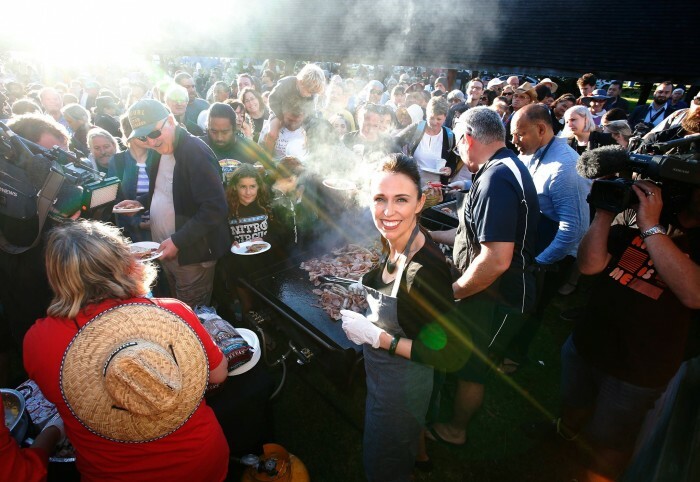 Ngā Hapū o Ngāpuhi supported by Waitangi National Trust were going to be setting up food and beverage stations and providing refreshments for the public attending pōwhiris for the Governor General and the Prime Minister. As they were also hosting buffets for the Governor and Prime Minister on two consecutive days they were asking for volunteers to lend a helping hand with preparation, cooking and clean up afterwards. We turned up at 8 am and were pretty amazed at the buzz of activity already in place. Security seemed to be high, and after a bit of to and fro-ing on radios we made our way to the Hobson building to meet Rowena and her team. John quickly made himself useful in the kitchen - he buttered and jammed a mountain of bread alongside a very welcoming group of women who were busy preparing bright orange crayfish, huge crates of raw fish in coconut milk, moist dark chocolate steamed cake, platters of fresh fruit, pipis piled high and smoked fish amongst many other sweet and savoury dishes for the buffets. Meanwhile I was busy in the marquee setting up tables, laying places and making new friends! Rowena, the aunties and the rest of the team, including young staff from the Waitangi cafe, the Whare Waka, were probably under pressure, but still found the time to be patient with us newbies and I felt very privileged to be a part of this occasion. There were three other volunteers and we pitched in wherever necessary. As the morning rolled on we drew near to our 11.00 deadline. This was when the pōwhiri for Jacinda Ardern was due to finish and her party of guests would be making their way over for 'morning tea'. The marquee was undergoing transformation into a beautiful dining space. The sides of the tent had been adorned with wall hangings and tapestries and now gorgeous flower decorations (courtesy of the 'aunties') were displayed on the tables dotted amongst an abundance of amazing kai, spectacular in colour and variety. Morning tea? This was more like breakfast, lunch and dinner combined! We had reached that time when there was nothing else to do until the guests arrived, so we popped out to watch the guests being greeted by the welcoming Haka, and then listened to speeches. This was the first time a woman had been accepted to speak at the Pōwhiri, and it felt like an historic occasion. The atmosphere was traditional yet super friendly. Jacinda Ardern was obviously well respected, doubly so, not only for appearing at the Treaty Grounds but for her open humility. The day was heating up, the sky was blue, the Navy were rehearsing for their big day on Tuesday, I was unbelievably happy to be there. Once the guests arrived and were seated we served steaming hot hangi, squeezing the dishes in like jigsaw puzzle pieces as the tables were so full of food. Not for long though, the Powhiri appeared to have worked up some appetites as we were soon clearing away huge piles of empty plates. We took them to John and Graham who were recycling and stacking everything to be magically washed by the cafe staff ready for the next buffet at 2.00 pm. As we worked many people thanked us, complimenting the food and appreciating the hard work. The marquee was filled with the sound of chatter and laughter, and some intense networking! The wonderful Ngā Hapū o Ngāpuhi team had been extremely busy for many days with preparation; the scale of organisation was incredible especially as they were feeding the public too. Their philosophy was that we were all special guests, today was for everyone and their unflaunted aim was to feed everyone and offer their warm hospitality to all. Later in the afternoon we gathered together as the Prime Minister wanted to meet the workers to say thank you. Everyone was pretty excited as Jacinda and her partner came over, spoke to us all and happily took part in the many 'selfies' and photo opps. What a day! John and I made our way home to showers and to put our feet up knowing that we had been a very, very small part of a very special occasion. I had learnt a lot about New Zealand's past and present. Thank you Rowena and the rest of the team, we'll always remember this day fondly.